Nobody likes hidden fees. 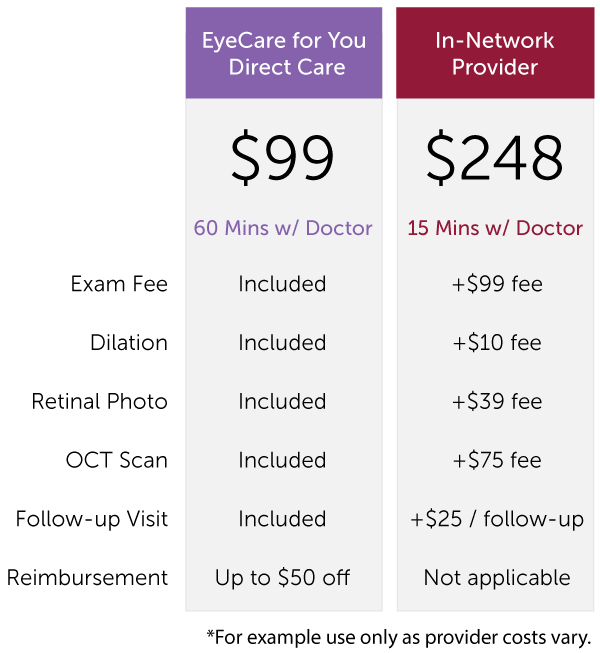 At EyeCare for You, we have upfront pricing so there are no surprises. Our eye exams include everything necessary to provide a high-quality exam without the additional fees. Most in-network eye care providers are scheduled to see multiple patients an hour and can only dedicate a few minutes for each patient. Before scheduling an appointment, ask how much time you will have with the doctor. We believe that our patients deserve time with the doctor and should never be treated like a number. At EyeCare for You, our eye exams are scheduled for an entire hour (60 minutes). This is your time with the optometrist. Vision insurance usually covers only a portion of the eye exam cost. Co-pays typically range from $10-$40. In the example to the right, we used $20. 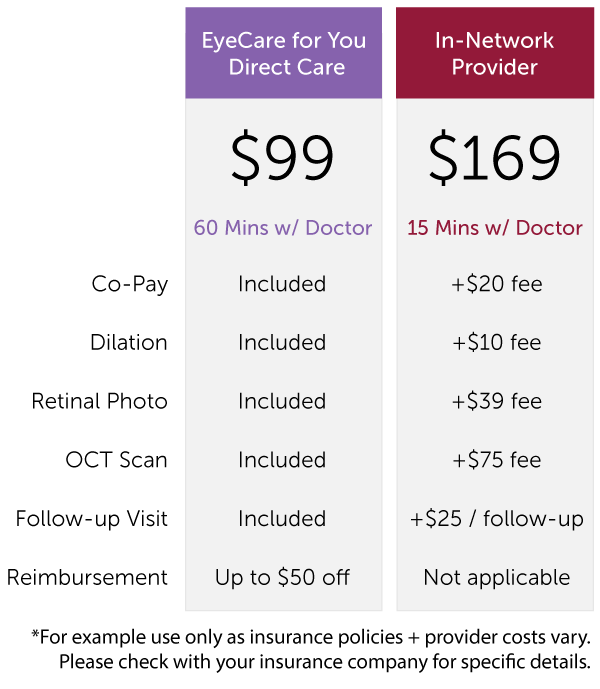 At EyeCare for You, co-pays are a thing of past. Dilation provides the eye doctor with the best opportunity to catch eye disease during an exam. All patients have the right to wave dilation during the exam, but we offer it at no additional charge. Retinal photos provide an excellent reference for comparing eye health year to year. Most practices like to tack on a retinal or "fundus" photo fee for this. Not us. An OCT scan images the tissue layers of the eye to check for diseases like diabetes and macular degeneration. The health of our patients is our first priority, so we provide a OCT scan with every eye exam. Prices for this with an in-network provider vary, but can cost upwards of $99. We used $75 in the examples. Follow-up visits are sometimes needed for prescription checks, especially for kids as their prescriptions can change as they grow. We include free follow-ups on prescription checks for an entire year to cover you until your next annual eye exam. In-network offices often have to charge you a "refraction fee" or even charge for the full cost of another exam. This 2nd exam is likely not covered by any insurance. In the examples, we included one follow-up and used a modest $25. New patients, seniors (60+), kids (18 and younger), and active duty military and their families all receive a discount of $30 off. Only $99! For most plans, we can help file for any out-of-network insurance benefits you may have. Most patients with insurance receive between $40-$50 back in the mail. We offer only the best eye exams at affordable prices, with or without vision insurance.